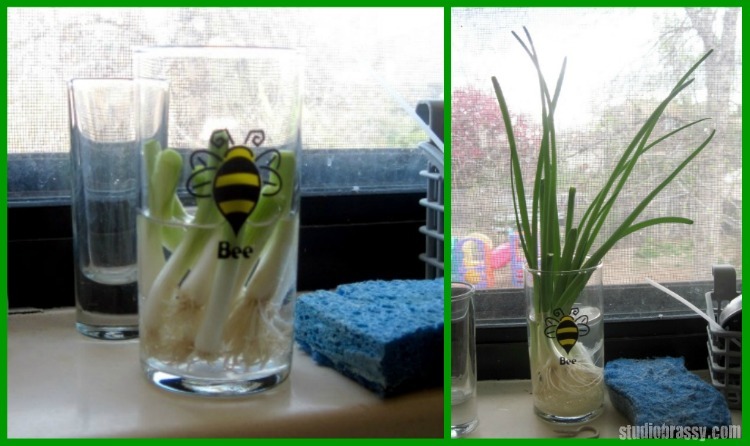 I don’t know where I first heard this, but I’ve been doing this for awhile: regrowing green onions (which are about 50¢ a bundle at the grocer’s here). After you chop up your green onions, leave the stems. I usually leave a couple of inches or so at the bottom. Then, put them in a glass with water and they’ll regrow. I put mine on the kitchen windowsill and change the water every couple of days or so to prevent them from getting slimey. How many times can you regrow them? Err… I don’t know. I’ve done it a couple of times with the same stalks before, though. I don’t use green onions all that often, so I generally will buy one bundle, chop it up, regrow it, use that, regrow it, forget about it, eventually toss it. But it works! And it makes me a little cheery to see them growing on the windowsill, too.